1) Fabrication of belts or filters. 2) Splicing rolls of foam or fabric where a continuous web is required. 3) Sealing box liners or valves of large chemical or food bags. Each sealer is freestanding with an option for lock down casters which allow for ease of transportation inside your facility. 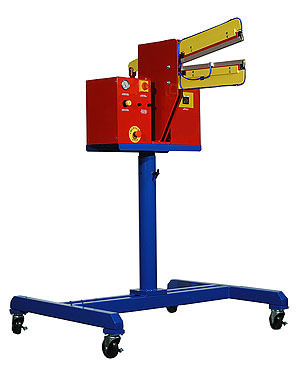 The machine is adjustable for a sealing height of approximately 40-72 inches from the floor. Our unique Aline sealing head can be pivoted within a 180-degree range. 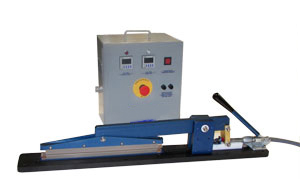 Controls are pneumatic and push button or foot pedal activation is available. Available in 15, 20, 25 and 30 inch lengths!